May 23, 2018, Toronto, Ontario –Ethiopian Airlines, the largest Aviation Group in Africa and SKYTRAX certified Four Star Global Airline, is pleased to announce that it will take delivery on 5 June 2018 of its 100th aircraft, a Boeing 787-900, the 1st for an African airline to operate 100 aircraft fleet in the history of the continent, thus maintaining its pioneering aviation technology leadership role and ascertaining its leadership position in all aspects of Aviation Services in the continent. 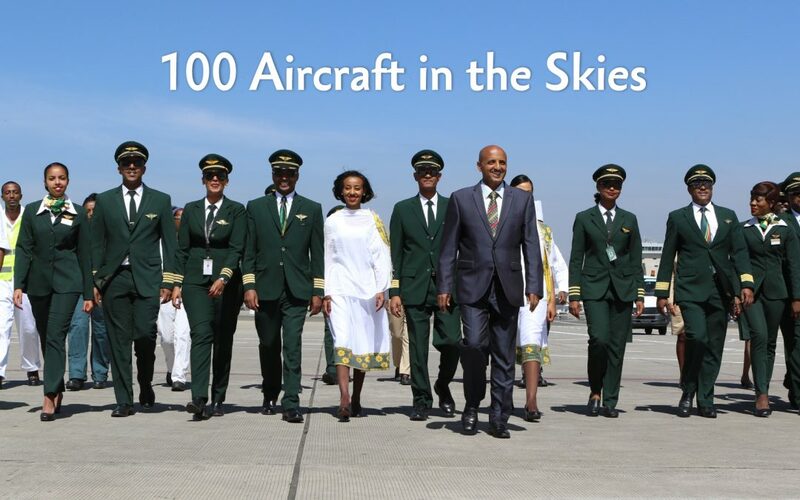 On the planned delivery of the 100th aircraft, Ethiopian Group CEO, Mr. Tewolde GebreMariam said: “It is an immense honour for all of us at Ethiopian to reach the milestone of 100 aircraft. This milestone is a continuation of our historical aviation leadership role in Africa and a testimony of the successful implementation of our fast, profitable and sustainable growth plan, Vision 2025. Ethiopian was the first to avail jet service in the continent back in 1962, and operated the first African B767 in 1984, the first African B777-200LR in 2010, the first African B787-800 Dreamliner and B777-200 freighter in 2012 and the first African A350 in 2016 and the first African B787-9 aircraft in 2017. Ethiopian now operates one of the youngest and most modern 100 aircraft, with an average age of less than 5 years. Fleet modernization and expansion is one of the four critical pillars of our Vision 2025 strategic roadmap, in support of our fast expanding network, which has now reached over 110 international destinations covering 5 continents. Our new and cutting-edge fleet composed of B787s and A350s offer unparalleled on-board comfort to our customers and offer the best possible connections when traveling within Africa and between the continent and the rest of the world. Ethiopian operates a mix of state-of-the-art aircraft with an average fleet age of five years. The Airline has 5 more Boeing 787-900 and 16 Airbus A350 airplanes on order, among others. Ethiopian was the first African Airline and second only to Japan to operate the B787 Dreamliner in 2012 and the first carrier in Africa to usher with the Airbus A350 XWB in 2016. Ethiopian Airlines (Ethiopian) is the largest growing Airline in Africa. In its seven decades of operation, Ethiopian has become one of the continent’s leading carriers, unrivalled in efficiency and operational success. Ethiopian operates the youngest and most modern fleet to 93 international destinations across five continents. Ethiopian fleet includes ultra-modern and environmentally friendly aircraft such as Airbus A350, Boeing 787, Boeing 777-300ER, Boeing 777-200LR, Boeing 777-200 Freighter, Bombardier Q-400 double cabin with an average fleet age of five years. In fact, Ethiopian is the first airline in Africa to own and operate these aircraft. The airlines operates three direct flights weekly from Toronto to Addis Ababa with connections 53 destinations Ethiopian is currently implementing a 15-year strategic plan called Vision 2025 that will see it become the leading aviation group in Africa with seven business centers: Ethiopian Domestic and Regional Airline; Ethiopian International Passenger Airline; Ethiopian Cargo; Ethiopian MRO; Ethiopian Aviation Academy; Ethiopian In-flight Catering Services; and Ethiopian Ground Service. Ethiopian is a multi-award-winning airline registering an average growth of 25% in the past seven years. Members of the media can contact us for articles, information or interviews.